Summary: This very popular walk from the beautiful village of Hawkshead to Lake Windermere will need to be planned but makes for a fantastic day out. Most people holidaying in Windermere or Bowness will probably want to visit Hawkshead sometime during their stay. The village is superbly kept with quaint streets, good shops and a generous helping of pubs and cafes. I recommend if you are staying in Bowness or Windermere to get public transport to Hawkshead after breakfast and explore Hawkshead in the morning. Then refresh yourself with a pub or cafe lunch in the village before setting off on this great walk in early afternoon. 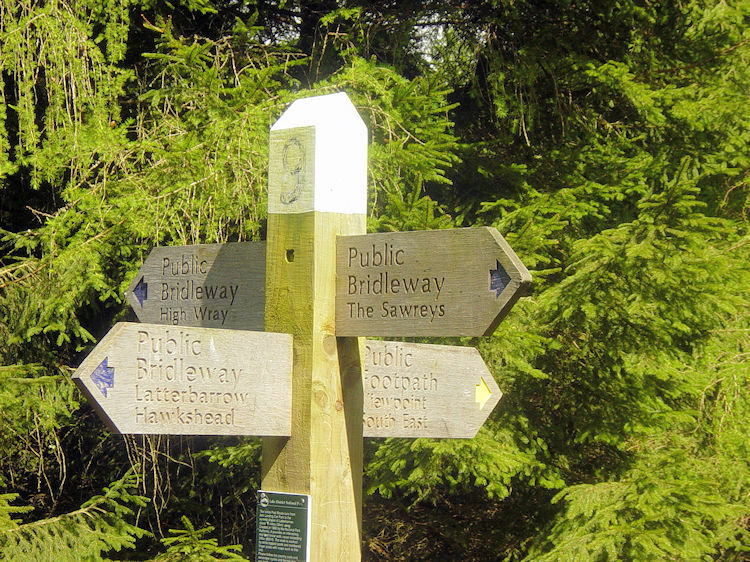 The walk over low fells and woodland is extremely well signed so even the less experienced walker should feel comfortable finding their way along the paths of the walk which finishes at the ferry house on Lake Windermere. Ferries run every 10 minutes so there is not too long to wait for the ferry crossing back to Bowness. 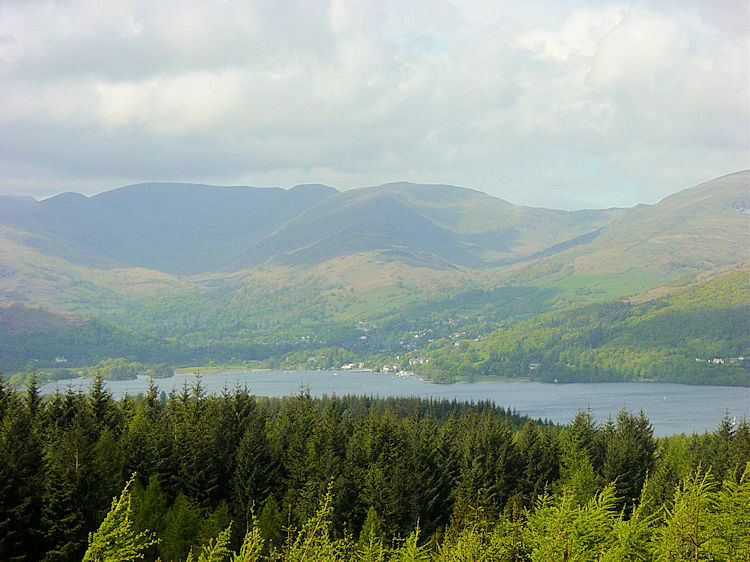 Some of the views from the fells over Windermere are breathtaking. 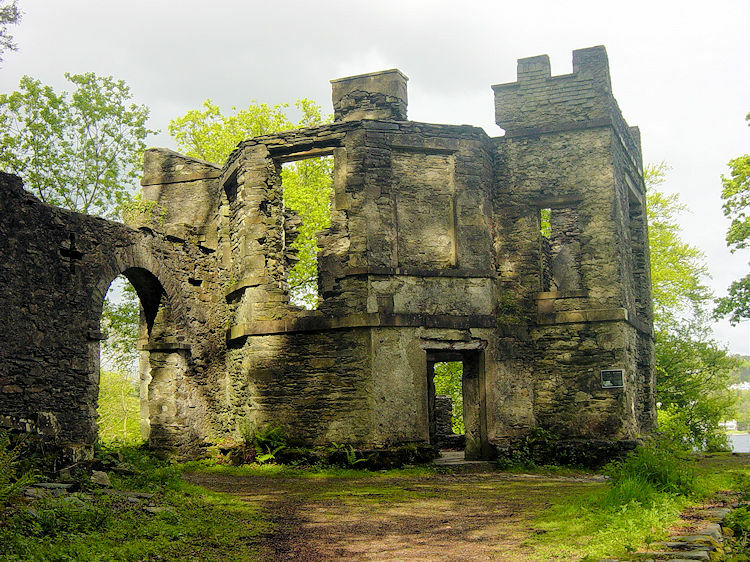 This is a super walk even those new to rambling will not regret doing. Go for it and I predict you will be wanting to do more. Steve and I were into our final day of our Lakeland walking break. All the big challenges had been accomplished - Pillar, Crinkle Crags, Bowfell, Dale Head, Robinson, The Old Man. All done. Now it was time to relax. It was also time to give Steve the map for I had planned all the previous walks. The final one was his choice. What would he decide upon? On more than one occasion during the holiday Steve had mentioned that he would have liked to go on a boat trip. Perhaps his desire to cross water led him to plump for this walk. Whatever the reason he came up with a gem. First of all the walk took us to Hawkshead. I had never been to Hawkshead. 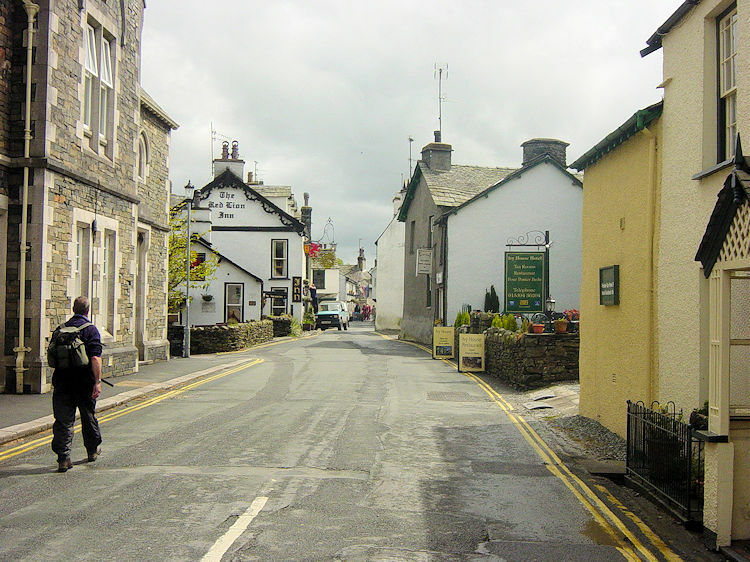 (Getting to Hawkshead from Windermere, or our base in Ambleside, is extremely easy as the Coniston Rambler Bus Service 505 runs every hour) The village is delightful. It is extremely compact with pedestrianised areas in the village centre. Steve and I explored the place and had lunch al-fresco. My Cornish pasty from the local bakers was to die for! The cheese pie was great too. After eating I was ready for a walk. We set off from Hawkshead just as the sun came out to herald a fine afternoon. Great stuff. We walked over lush fields east to Scar House Lane and continued east to Crofts Head. From Crofts Head we crossed a road and went through a gate into Colthouse Plantation. Now the climbing began. I was sweating almost as soon as the climbing began for the sun was warm and the atmosphere close. It had rained in the night and early morning so the water just deposited was on the rise straight away. The climbing was never steep though, just constant. 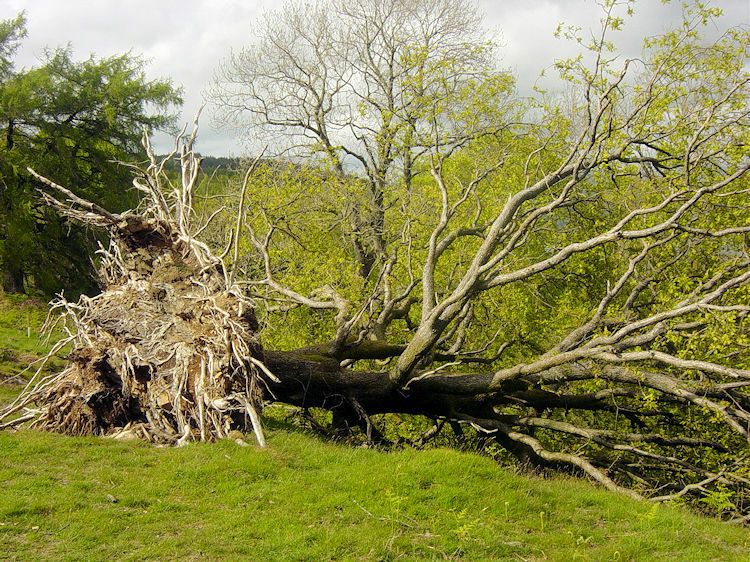 As we walked through the plantation we noticed collapsed trees all over the place. 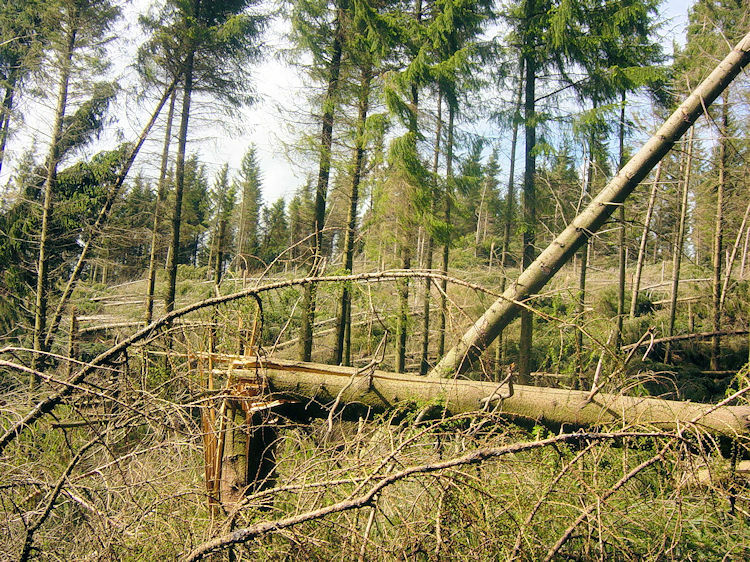 There were mainly conifers but some native oaks were also casualties of the devastating storms which hit the Lake District in January. The storms had also flooded Carlisle causing mass evacuation of the city. Evidence of their devastation hardly show in Carlisle now such was the haste of the repairs. Up here it will take much longer. There must be thousands upon thousands of devastated trees to remove. As we continued to walk there were masses of them, many totally uprooted and many more severed halfway up the trunk. The sights were amazing and will continue to be so for some time until the tidy up is complete. Steve and I tried to imagine being up here during the horror of the awesome storm. A frightening thought. Luckily for us it was peaceful, sunny and warm. 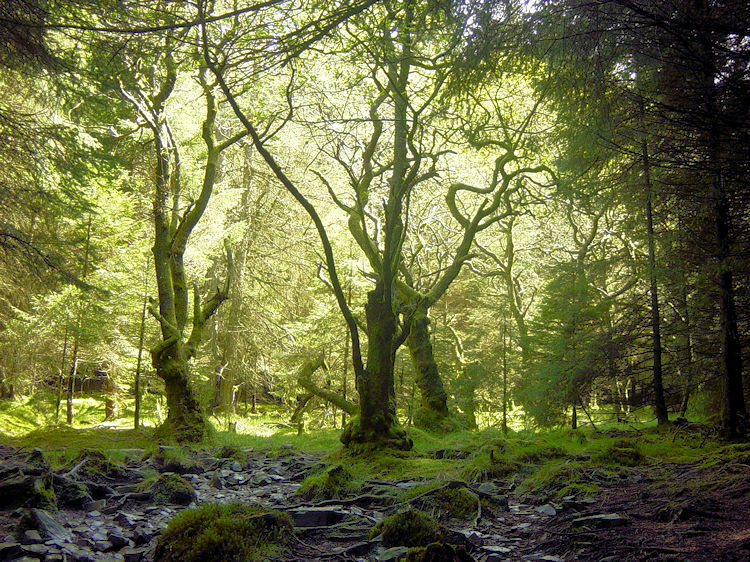 After about a mile of climbing the walk became a gentle undulation through woodland and clearances. Paths criss-crossed this popular rambling spot but fortunately there were well signed guideposts at path junctions. We continued on our meandering but mainly southerly course through the woodland, sometimes in eerie darkness but mostly in piercing light until we rose to the top of the tree line at High Blind How. We were now at out highest point of the walk at 270 metres. 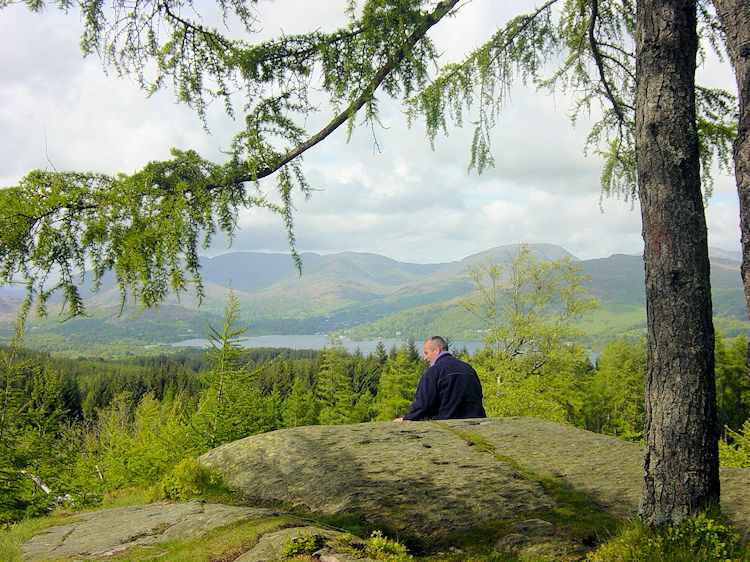 The views from the trig point across Windermere was simply brilliant. They were so good we settled down for a final break of our final walk to admire them. After our fabulous break at High Blind How we descended back below the tree line to follow the path around Black Stone Mires and High Pate Crag. The crag could just be seen through the dense green of the tightly packed trees. Our descent took the view of Windermere from us but not always for we often spotted the water to our left in less densely packed sections of the wood. There were still exposed areas of woodland devastation as we began our gradual descent to Scale Ivy Intakes and then Mitchell Knotts. At the Knotts we met a group of walkers who told us we were not far from Claife Station and the ferry. What they did not tell us was the severity of the descent. And the final descent to Claife Station is steep. We dropped down from 150 metres to 40 metres in 300 metres of walking. Some of it was more than 1 in 2! The brakes were full on going down and it was as steep as it gets in some places. Wow, what a variation to our gentle walk, and so near the end. But not a finish, not quite. After the descent there was the small matter of 400 metres along the road to the ferry and then after our ferry crossing another kilometer to the bus station in Bowness. Then we were finished. Now it is your turn. Go on, it is easy. Be steady on that final descent though.